With over 2,500 suppliers listing their plant, equipment and subcontractor services on PlantMiner, it makes it difficult to know which suppliers your quote request will be exposed to. 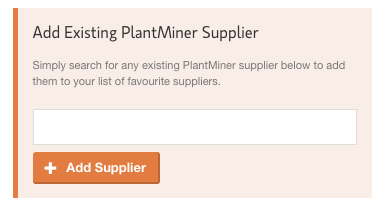 In order to simplify the hiring process and reduce the time spent selecting the right quote from the right supplier, we are introducing PlantMiner’s Preferred/Favourite Supplier Lists. Whether you have a Preferred Supplier Agreement (PSA) in place, or have a list of favourite suppliers you have previously hired from, our Favourite Supplier feature will ensure you receive the most appropriate quotes for your job, from the companies you want to receive them by. Sign into your PlantMiner account. If you have forgotten your password, please select 'forgotten password' and someone from our team will be in touch. Click on the Favourite Supplier tab along the top of the window. 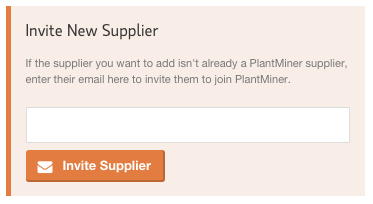 Add existing PlantMiner suppliers to your favourite supplier list. Type in the company name and select from the drop down menu. Select ‘Add Supplier’. Manage your Favourite Supplier list and watch it grow. Have the ability to delete supplier as well as view their profiles at the click of a button. If you have an already existing Preferred Supplier Agreement (PSA) or know of a supplier you would like to hire through but they are not an existing PlantMiner supplier you now have the ability to send them an invitation. On accepting the invitation, you can then add the company to your Favourite Supplier List. Keep track of the invitations you have sent, in order to keep track of your favourite suppliers. PlantMiner is a free and fast way to find plant, equipment and subcontractors. Not only will it save you time and money, but you can now get rewarded for hiring through PlantMiner with PM Rewards. The addition of our 'Favourite Supplier Feature' will give you the flexibility to source quotes from your favourite suppliers in once place. To start building your list, login to your account here. To find plant, equipment or subcontractors for you next project, click here.